The sun-blasted, magic-scarred campaign setting of Dark Sun is unlike any other published for Dungeons & Dragons. It inverts or eliminates many of the core concepts of D&D: arcane power is rare, psionic abilities are rampant; Halflings are cannibals, dwarves are slaves, and elves are opportunistic, lying traders. The world itself – known as Athas — is danger incarnate, with civilization reduced to a handful of city states separated by vast, dangerous stretches of desert populated by mutated monsters. The shear alienness Dark Sun demanded a monster manual, and Wizards of the Coast delivered. The Dark Sun Creature Catalog is 143 pages of monsters, threats, and non-player characters that game masters can use to fill the setting’s ruined expanses and rare oases, as well as new rules for converting existing monsters to the setting. The book largely succeeds in its mission, providing game masters with the unexpected horrors that are its trademark and failing only to provide the run-of-the-mill city encounters that would make urban adventuring easier to run. Reading through the Dark Sun Creature Catalog, the thing that struck me most was the sense of history obscured: the idea that each of these creatures has some greater story that could explain how it became the twisted horror it is today. The entire setting is like that – we know that Athas was once green and verdant, and that arcane defilers corrupted the world and turned it into the hell we see today – but the specifics are always just out of reach. That lack of specifics can be maddening, but in a setting like Athas, which is all about surviving in the now, that lost history just adds to the ambiance. A good example is the Brohg, four-armed giants who have an innate sense that lets them sense arcane magic. They instinctively know that this power is responsible for the wastes around them, and they distrust all who wield it. Yet at the same time, the Brohg occasionally give rise to an arcane spellcaster, who’s immediately cast out of the clan as soon as he’s recognized. The back story suggests some great magical harm affected the entire race long ago, but the dim giants don’t remember it. The Sand Brides are once benevolent fey that have been corrupted by defiling magic. These seductresses haunt desert oases and serve as examples of how something that was once good and true has been warped into a dangerous new form. The same can be said of the Elandrin. I was ambivalent about Players Handbook 1 including two elven races, but in Dark Sun, it works: the elandrin’s Feywild home has been all but destroyed, and the survivors now wander the ways angry, insane or both. Rather than just being another kind of elf, they become an example of just how different Dark Sun really is. Aside from the elandrin, each of the main races of Athas – human, dragonborn, halfling, mul (half-dwarves), etc. – gets a write-up in the book. As in the core monster manuals, these racial write-ups are useful for slice-of-life encounters in Athas, as well as for combats out on the dunes. The Nightmare Beast is a Level 25 beast that’s the stuff of legend. These holdovers from the apocalypse that ravaged Athas are huge, shadow-tainted creatures that are capable of overwhelming opponents in melee combat, while simultaneously pummeling them with necrotic energy. It’s “Black Lightning” power is a close burst attack that does 30 points of ongoing lightning and necrotic damage, and if the opponent fails a save, they drop unconscious. It’s “Dream Step” power allows it to teleport adjacent to an unconscious character, while it’s “Horrid Nightmares” ability allows it to do 5d10+5 psychic damage … and the opponent can’t make any saves until its next turn. The best part though, is that the known history of the creature is utterly at odds with its true origin (which is spelled out in a sidebar). I liked that the catalog occasionally pealed back the veil to reveal the real history of things; rumors and legends are great but while I don’t want to know all of Athas’ secrets, sometimes it’s nice to have a definitive answer. Then there are those beasts uniquely Athasian. The Id Fiend are psionic reptiles that provide a good, dangerous low-level threat to player characters. Their “manifest fear” ability dazes and slows opponents in a close burst, which “fearful torment” builds on by doing additional damage and immobilizing them. In a world without horses, the reptilian Inix and the insectoid Kank provide both mounts and beasts of burden … if they can be captured and subdued. The Thrax are water vampires who’s “drain fluids” ability does necrotic damage to their opponent (knocking them unconscious if the attack causes them to become bloodied) and heals the monster. The Silk Wyrms are psionic, human-sized worms capable of telekinetic flight. They’re also an evolving threat; the low-level hatchlings are pack-hunting minion-type creatures while the adults are solo skirmishers capable of concealing themselves in dusk’s shadows while simultaneously mesmerizing their opponents. The silk wym’s “mesmerizing dread” ability allows them to draw opponents closer, while simultaneously lowering their defenses. The Silk Wyrm Elder is a Level 14 skirmisher that once again hunts in packs, bring with it all of its lower level abilities, but with scaled up statistics. There are also the occasional stranded outsiders. The Gith are one such race, trapped on Athas long ago when their spelljammer passed through “the Gray” (the Astral Sea in Athas-speak) and found themselves unable to leave. They’ve since descended into savagery, albeit one that retains their potent psycic powers. The abominable psurlons are another race that immigrated to Athas, though their case they were drawn by the world’s psionic potential. Their worm-like forms and alien mindsets make them a perfect fit for the seting. Athas has no true dragons (except, perhaps, the Dragon of Tyr, who is a singular creature of immense power). Instead, it has drakes, elemental reptiles that fill a similar role. The catalog details four such drakes: water, fire, earth and air, and offers advice on converting traditional dragons to Athasian equivalents. The drakes are all high paragon to mid-epic tier threats, making them something that players are unlikely to encounter until late in their adventuring careers. They are physical brutes, and as such are likely good for big, monstrous brawls. The catalog dedicates a chapter to named non-player characters. Foremost among these are the sorcerer-kings that rule the city-states of Athas, which I found surprising, mostly because I’d expected them to appear in the Dark Sun Campaign Settiong . It wasn’t until I’d finished reading the campaign guide, all the while grumbling about the lack of major NPC write-ups, that I turned to the catalog and found them there. For some reason Wizards chose not to promote the sorcerer king write-ups in the campaign guide, which seems like an odd oversight on their part. The sorcerer king entries are decent, but not spectacular. Much of the deeper background on the kings and their realms is found in the campaign guide; the catalog gives a one-page description, and extensive statblock, and write-ups on their high-level templar servants. It’s the follower NPC write-ups that I found most disappointing; while each king gets at least one paragon or epic tier templar write-up, few get heroic tier enforcers. I found this disappointing because it’s exactly the heroic and lower paragon where PCs are most likely to encounter templars. A templar template or theme specific to each sorcerer-king would have gone a long way toward conveying their unique style of governance and power in the city. The Creature Catalog provides game masters with plenty of non-monster tools for recreating the world of Athas at their game room tables. It dedicates two pages to customizing existing, non-Dark Sun monsters to the setting. It’s straight-forward advice – change the monster’s appearance but keep the mechanics the same, come up with alternatie, Athas-specific lore for the beast, transplant a monster from one environment to another or introduce new powers. The “silt shark” is given as an example – it takes a traditional, ocean-dwelling shark, and transforms it into a flesheater that lurks beneath the silt sees of Athas. They chose a good example – while I was skeptical about the conversion, the illustration they include – of a shark lunching out of the silt to attack a struggling adventurer – really sells the concept. The book builds on the “monster themes” concept introduced in Dungeon Master’s Guide 2. Themes are suites of attack and utility powers that can be swapped out in place of a monster’s normal abilities. Examples in Dark Sun include “Arena-Bred Monster”, which features powers like ” bleeding attack” which causes five ongoing damage when the creature bloodies an opponent, or “necessary betrayal”, a utility power that let’s the creature swap places with an ally … and then have the ally take the damage meant for it. There are also “Elementally Infused Monster”, “Psionic Adept”, and my favorite, “Sunwarped Monster”, which gain mutations from their exposure to the unrelenting sun. When I ran 4th Edition regularly, one of the challenges was finding enough monsters to fit the particular adventure I was running. It’s easy to see Dark Sun running into similar challenges, even with all the other monsters in the book. Themes provide a good way of quickly transforming an ordinary monster into something much more Athasian. I’ve always been a big fan of terrain and traps in D&D 4th Edition; if you’re going to go all in as a tactical miniatures game, then you have to have a compelling battlefield. That’s all the more true in Dark Sun, where the terrain has to be alien and weird in order to help drive home the otherworldliness of the setting. The Dark Sun Creature Catalog gives us 14 new kinds of terrain, from the “glimmering mirage” (which grants a concealment bonus to those next to it) to “lightning pillars” (monoliths that combatants can use to discharge lightning bolts into their enemies) and rocky badlands (filled with unstable pillars that can be knocked over to hurt enemies). There are also four and a half pages worth of hazards. Among my favorites are the “Blood Trees of Gulg”, which grow in the city-state’s arena and feed on the blood of those who die there. The trees themselves lash out at anyone who gets too close. I also liked the “Badlands Tremor”, a localized earthquake that can knock players prone, and the “Dust Funnel”, a desert tornado of sorts. 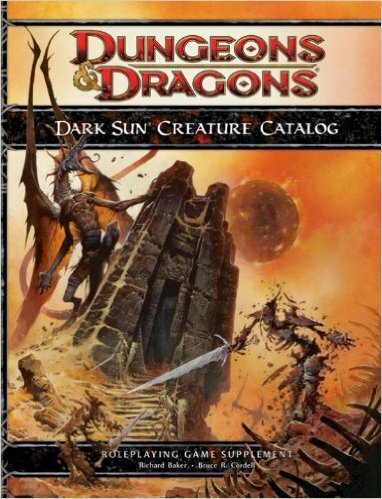 While I think the book missed some opportunities with low-level minions for sorcerer-kings, and would rather have seen it get the full Monster Manual treatment, Dark Sun Creature Catalog is still a good book that succeeds in its mission. It gives dungeon masters the tools – including monsters, NPCs, and terrain – they need to populate the Athasian wastes. The book’s compelling mix of creatures makes it worth picking up even if you’re not running Dark Sun. Almost every campaign can benefit from a dose of the weird, and you don’t get much more weirder than Dark Sun. Note: This book is based on a review copy of the book. Previous Post:Can you survive arcane wastelands of the Dark Sun Campaign Setting?